I thought this erasure was about my father, how strange to say dad’s arc, I’ve barely even called him dad. I thought reading my father’s columns I would understand him. I do, I question: dad as character in story, alchemy and dad as story dad as story with The End. I can go to the website, look up new hire (less new every day), see the magazine share his byline, content classification: influencer, industry leader, opinionated. Arc and ark. If you are reading this you are not reading my father’s columns. Listen, engaged, as my father talks. Talks more, writes things down for me when I’m driving even though he’s not one to gossip or complain. I’m glad I get to be a good son, ask about his past, where he worked—What did you do in the eighties? Survived Reagan—compare notes with This American Life’s trash hour, The New Yorker on Egyptian garbage or witches’ knickers, art history: The Maintenance Artist, Mierle Laderman Ukeles, NYC, late seventies, shaking every sanitation workers’ hand, “Give a Hand to the Garbageman” (he thought that was really cool). Jae Ko’s Kraft Paper relief sculptures stacked like frozen waves. Bryan Zanisnik’s comic childhood bedroom. A back-stabbing rival of my father quoted in my state newspaper on cardboard theft reflecting market strength. We can’t collect what isn’t made. Now he says he’s trying to gracefully retire for the next two years and I won’t be surprised if I don’t make it past the summer. I’m not sure which sentence contains the other. One of my weaknesses, Josh, is I’m not a very good self-promoter. If you think I’m a very good name-dropper, you’ll learn all the names I’ve dropped I had in fact known. He’s told me this before. And Josh don’t put this in your damn poetry as I pulled out a blank page. Producing little of its own paper pulp, China relies on the recycling bins of other countries to be its forests. 1/6th of US recycling is exported to China. This dramatic increase in exports of paper recyclables has resulted in the best, most stable markets in years. Strong prices made the difference between success and failure for many curbside recyclers. Recycling is an imperfect cure if these products are exported to operate under conditions that show complete indifference to worker health and safety. Anything less makes a mockery of our belief that recycling makes the world a better place. My father’s worked three jobs his whole professional career. His reward, so far for keeping his: two employees’ workloads, split and added to. He still worries he’ll be put in a position where he’ll have to ask to be fired. I’ve started adjuncting. Somehow I’m more contingent as a teacher than an at-will stock-boy. I’m employed at every stage of the writing process: Lost the retail, kept the Writing Center and grading; I’ll need the money soon. Some people think Washington does not know best. I grew up in Oklahoma, I never thought Washington knew best. DC, city of my birth, miserable, polluted swamp, where he can do the most good. Here you live your ideals by announcing them: “As for me, I will continue to make compost in my backyard. If you are in my neighborhood in the spring, stop by and enjoy my flowers.” People good at PR are soulless, my father adds. Facts do not need souls. “I too have made the mistake of bagging the recycling and throwing it in with the garbage.” I’m glad he feels the need to write this! Hating chicken hawks. That we took karate together when I was eight. Hunters make the best conservationists. Desperation, the slink of public drunks, his own father’s shame. He’s not those things. We live in a litigious culture, he’d often say, but he knows a lawsuit’s threat. Is he what he is or what he is not? What he does or did? Why he makes such an effort to be a good father—his wasn’t always there—I hope its inverse has its own logic as well. Why take the time to join your morality and reason? He always claims his latest columns are particularly fine. “When reality hits the road,” he writes, or “It’s time to go hunting where the ducks are,” gung-ho, he means it. Yet some people seem to believe that recycling is automatically a moneymaker. If only life were that easy. Their hauler has to pay for the crew and the equipment used to collect and process those recyclables. They also have to cover all of the other costs associated with running a business. Yes, the paper, cans and bottles you put on your curb have value. But rarely is that value enough to cover those costs. After all, if our old newspapers or plastic bottles were really valuable, we would sell them ourselves. I used to say if I was having a baby, it was going to come out of my big mouth. New year’s my wife is pregnant: we are enthusiastically ignorant! My parents come to visit. When you’re with your dad and writing about him, actions become more closely associated with their meanings: we bike together, I pass him up an over-pass and stop on the other side so we can turn back. Old enough I’m constantly asking my dad questions again. As a child because I didn’t know, as an adult because I’m afraid I won’t get another chance. We turn home. I pass him again in the other direction, but then he passes me. Paper stubbornly refused to go away when predicted in the mid-nineties…then spectacularly. ARE HIGHER STANDARDS GOOD FOR RECYCLING? The Chinese government continues to insist that the United States and Western Europe lower their greenhouse gas emissions, even as it argues that China, currently the world’s largest emitter of greenhouse gases, should not be forced to lower those emissions. They want to keep on polluting in order to raise their standard of living. In other words, “smoke means progress,” and dirty air means more of the good things in life. 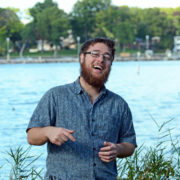 Joshua Gottlieb-Miller has poems which can be found in Grist, Four Way Review, Pleiades, Indiana Review, and elsewhere. “Circles” is a chapter from a manuscript combining poems, prose, and erasures of his father’s column on recycling issues in Waste 360 magazine. He is a PhD candidate at the University of Houston.